12-year-old precocious chemistry genius Flavia de Luce is one of my favorite characters is fiction. Having been introduced to her via the excellent audiobooks, she also has a very strong voice in my head, courtesy of Jayne Entwistle. While I read her latest adventure, As Chimney Sweepers Come to Dust, in physical format, I cannot recommend the series on audiobook highly enough. It's difficult to review this book without giving spoilers away for previous books, so please be warned! In the seventh book in the series, Flavia is off to Canada for school, though it's not entirely clear if she is going there to learn academic subjects or to master skills needed to join the super-secret organization her aunt inducted her into, the Nide. 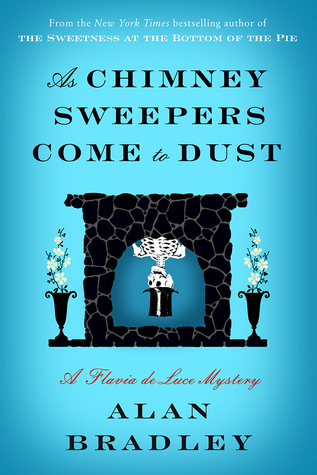 Of course, a dead body shows up very early in the story (yes, in a chimney), and Flavia tries to solve that mystery, too. Unfortunately, I found this outing to be fairly disappointing. It felt very unorganized, to the point that even Flavia was utterly confused by all of the things going on around her and how they fit into her life story. The mystery takes a backseat here, which I was fine with, but nothing else really comes to the fore to take the spotlight. I was confused by so many things in this book that were never really cleared up. For example, the school's principal is by turns very kind and very cold-hearted. Some girls from the school have disappeared over the past few yeasr, and no one is supposed to talk about them, but obviously everyone remembers them. Some of them show back up, but it's never made clear as to why they had to disappear and then show up again the way they do. Part of what makes Flavia so magical is the setting of Bishop's Lacey and the characters around her. Flavia loves her home so deeply, it is sad to see her homesick all the time. In Bishop's Lacey, she's a lonely girl without anyone around who is the same age or intelligence level, so it makes sense that she traipses around the countryside and gets into all sorts of mischief. At boarding school, she's surrounded by other girls but she never gets close enough to any of them for their personalities to develop. It's weird that there are so many other girls introduced when hardly any of them have a material role to play in the plot. It also makes the absence of other beloved characters, most importantly Dogger, even more obvious. I didn't quite understand why Flavia was sent to a boarding school in Canada in this book. I don't know why she couldn't have just gone to school somewhere in England. It feels like Bradley wanted to get her away from Bishop's Lacey so that events could happen away from her curious eye. I hope that's the case, and that the next book clears a lot of my confusion. But there's a long time to wait until the next book comes out! Still, this remains one of my favorite series, and Flavia is still delightful (as is Bradley's absolutely amazing skill with a simile), and I am excited to see where she ends up next. I still haven't read a Flavia book, and I just know I am missing out. But seven books in seems like such a commitment!!! I thought this book was a nice break from Flavia's normal routine but I was also glad when she decided to head back home. Bradley has said that he never wants her to grow up fully so I think this was a way to have her experience some more adult feelings in a young person's setting. If she had just gone to school down the road from home, I don't think her experiences could have been the same. Yes I was confused too. I'm not sure why Bradley took her away from Bishop's Lacey, especially given the ending of this book. Maybe everything will make more sense in the context of the next book. Some of the books in this series got wet back when we moved so I fell behind because I haven't replaced them all yet. :( I really need to get the one that I am still missing and read the whole series finally! I can't wait to read this one - I just love Flavia. I'm assuming this is probably setting us up for a new story arc but I'll take anything with Flavia in it!